Los Angeles, Calif.(April 28, 2014) – Seatzy™ presents the World WarII action-packed, riveting drama portraying the rescue of Dutch Jews during the Holocaust and the compelling story of a young band of passionate teens through the formation of their own Resistance Army, in Return to the Hiding Place. See info here: www.hide-movie.com. Slated to open in a dozen cities including, Atlanta, Chicago, Dallas, San Antonio, Texas and Washington DC on May 23, 2014, the multi award-winning film stars John Rhys-Davies (Indiana Jones, Lord of the Rings), Craig Robert Young (“NCIS: LA,” “Hawaii Five-O”), David Thomas Jenkins (“CSI:Miami,” “Bold and the Beautiful”), Rachel Spencer Hewitt (Fly by Night, A Civil War Christmas) and Mimi Sagadin (The Dilemma). Return to the Hiding Place is scheduled to release in select cities through the movie ticket reservation platform and film distribution company called Seatzy™. Seatzy allows moviegoers to participate in the process of supporting the films they love by getting ticket reservations (500 minimum) in early and assuring the film will play in the theater closest to them. Tickets for San Antonio, which when reserved/purchased will ensure that the film shows in this city, are currently available via www.seatzy.com/hidingplace. 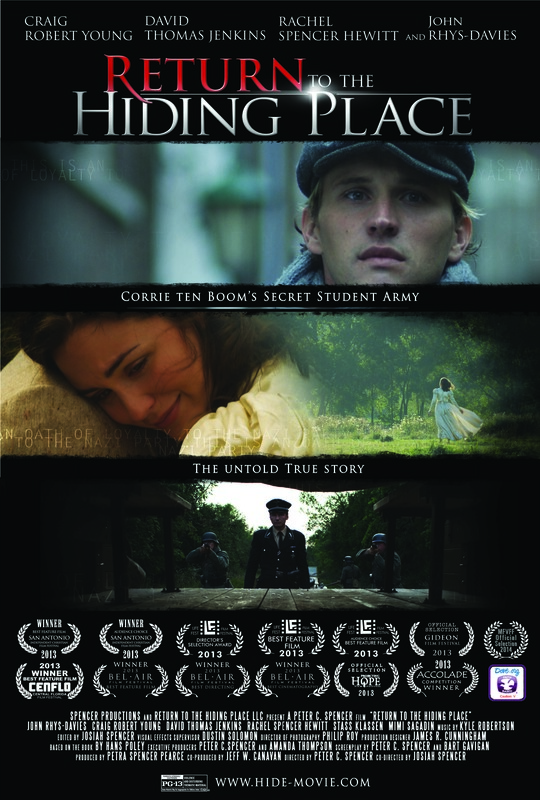 Directed and produced by the father daughter team of Peter C. Spencer and Petra Spencer Pearce, Return to the Hiding Place also features a stellar crew that includes editor Josiah Spencer and co-producer Jeff Canavan.